Can Commercial Gates Benefit My Business? Your commercial property is the beating heart of your company. From here, or any one of your other premises, the whole operation is conducted; whether that’s the physical dispatch of goods, or an office wherein the people in the know answer phone calls from the people requiring your services; without a place of residence, the company would be very different indeed, perhaps even unable to function. As such then it’s important that your property is as primed and prepped for business as possible, and that means covering all bases! That in mind, here’s just how an automatic gate from us here at Motion Gates could make a difference to you today! Of course, the presence of a large, palpably sturdy and ominous looking gate is one of the greatest deterrents you can put into place on any premises. Not only do they look difficult to get past, and indeed, very much are the strong and robust fixtures they appear, but they also give off the impression of a company who has a significant level of security in place, thus warding off potential thieves. Similarly, with the large range of electric gate options available, you can make speed and efficiency a focal point of your entranceway, whilst still providing that extra level of security. 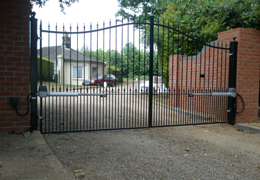 There’re a host of different types of gate that all come with various opening mechanisms, from remote, to keypad entry, whatever your requirements, you can make the process simple and smooth! Fortunately, good quality electric gates need little overall maintenance, and just by using them correctly, a guide for which we can talk you through, you’ll ensure that they go the distance and last you as long as you require their assistance! Furthermore, we can provide great quality maintenance and repair should you find yourself in the unlikely situation wherein something has in fact gone wrong! All bases covered. 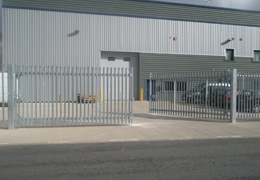 Get in touch today to discuss your needs and find out just how automatic gates can help your business!